Gallery of Vicki's designs, classes etc. 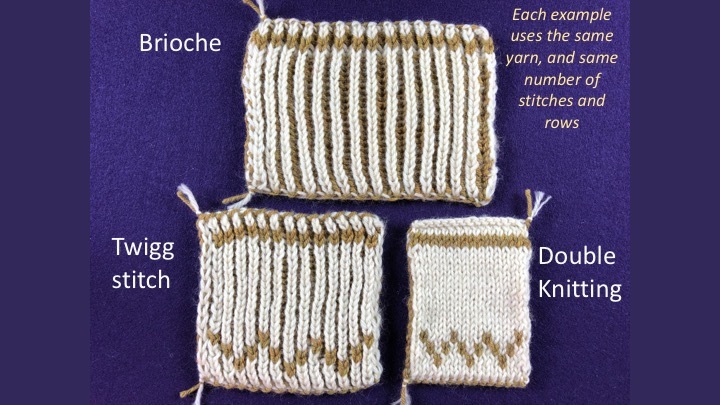 While we were making the video that introduces Twigg stitch, I made this graphic that illustrates the difference between Twigg (which knits up pretty much square) and a couple of other techniques that people have mentioned might be similar. It is a fascinating comparison. Each swatch uses the same yarn, the same needles and the same number of stitches and rows. There's a least one knitter we've come across who has knitted in Twigg using Brioche patterns... it needs some translation, but it's a great idea. What do you think?